Ever home has them. Wall zits. Or, like normal people call them, outlets, vents, radiators, light switches. These necessary things in our homes that are not always well placed, or pretty. The apartment is also a victim of these wall crimes. See for yourself. In trying to create a little drop zone using the antique table we got from my parents, I realized that the wall needed some artwork to anchor the little vignette. Trouble was, the intercom is RIGHT THERE. Glaring at us. And still in use. So no big fancy mirror or large print. Boo. Then, while on one of our weekly trips to the ReStore in Pittsburgh, I came across this old beauty. Though the Victorian woman is intriguing, what I was really drawn to was the frame. And that naturally aged patina! Soooo pretty! …and then he graciously held it up for me to see what it would look like. But the point of holding the frame up – looks pretty good, eh? And if we set the intercom in the bottom corner the frame is actually centered on the wall! So what to do…. just put the frame on the wall? No. Dressed up cork board? Yes! So after tracing the frame on an old cork board, Bill got to work murdering it. Then he checked to see that it fit, and shaved off a bit more before it was just snug enough. Then he measured the intercom and trimmed the corner piece to match. But leaving it boring cork wouldn’t do. 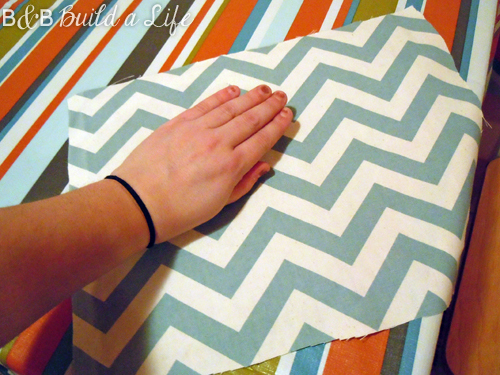 I had planned to paint it, but Bill suggested using a scrap from the chevron drapes. So I broke out the spray adhesive and clipped a piece of fabric the right size to fit the board. After a quick coat of spray glue, I smoothed the fabric across the board. Once the fabric was secured smoothly to the front of the cork, I wrapped the edges around and secured them to the back with hot glue. Then to put it all together, Bill applied tacky glue along the edges to adhere the cork to the frame. After letting it dry overnight, I added some velcro command strips to the back for hanging. And voila, a pretty cork board that helps camouflage the intercom and actually creates a functional feature too. 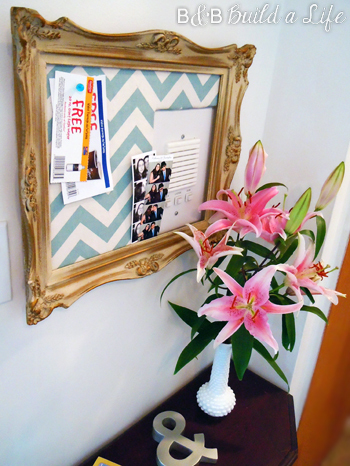 Now we can display fun photo strips or movie tickets, and even free coffee coupons too. It’s helpful when you have anniversary flowers handy to dress things up. They just keep blooming! So what do you think? 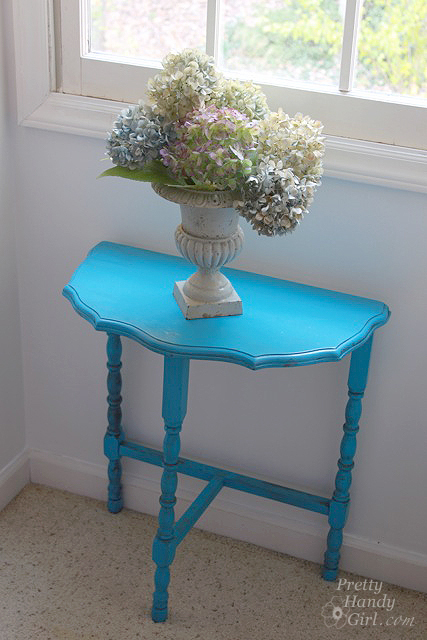 I have hopes of painting the table, in a sort of muted version of what Pretty Handy Girl did with this table that was part of her Arts and Crafts Room Reveal recently. Before we commit to painting it, Bill and I want to be sure it is more of a run-of-the-mill antique tables instead of a more one-of-a-kind type. So far we know it is from Tomlinson Chair Manufacturers, and there’s a label that says ‘209 Mahogany’ on it. If you have any pointers on how to learn more, let us know! 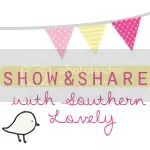 Showing Link Lovin’ to these fine blogs…. What a great solution for “disguising” those “wall zits.” That’s a funny term I haven’t heard before but I like it ;-D. Just a side note, if you do paint that half round table. Use a REALLY good primer on mahogany furniture. It will bleed something fierce if you don’t. Good luck. Ok this is pretty darn creative girl….I hate those must have distractions to our decorating walls that the contractors can not put somewhere less obvious too and you have given me some inspiration! Very well done! Thanks! It works out pretty great! Thanks for stopping by! That is one of those *smack your forehead* ideas, but it took you two to bring it to life. Well done! I will be pinning this to show my apartment dwelling friends. Wow! You came up with an excellent way to “deal with” that wall! Great job! Super cute! What a great idea to hide those ugly electronics.